I'll admit that I somewhat backed myself into a corner with my last big speaker review. In it, I rather tersely summed up my criteria for a good speaker as tonal neutrality, low distortion, and excellent time alignment between the disparate drivers, and I confidently proclaimed the speaker in question an unmitigated success on all fronts. So how, now, do I square that with the fact that I'm thoroughly and utterly in love with another pair of speakers that checks off all of the same tick marks in terms of what a good speaker should sound like to me, yet somehow manages to sound utterly different in so many other ways? To be frank, I stopped trying to square that circle somewhere around the third draft of this review. Because, despite the well-researched science behind speaker design, there's still room for variation. There's room for different approaches to high fidelity. And there's certainly room in the audio market for yet another $2,500, high-performance loudspeaker--especially one as beautifully crafted and meticulously engineered as Paradigm's Prestige 95F floorstanding speaker. If you're hip to Paradigm's existing speaker lineup, you can in many ways think of the Prestige Series, atop which the 95F sits, as the successor to the company's über-popular Studio Series (a quintet of which serves as the reference speaker system in my main home theater, in the interest of full disclosure). That fact isn't immediately obvious at full glance, since Paradigm has done away with the Studio Series' teardrop contours in favor of a more minimalist monolithic shape. Driver configurations are also radically different, and the Perforated Phase-Aligning Tweeter Lens, in particular--which protects the tweeter from prodding fingers and acts as a phase plug--makes for a speaker that looks quite unlike anything Paradigm has ever crafted. Along that same line, the visible fasteners that adorn the front of my Studio 100s have been nixed in favor of a completely screw-free façade. Plastic accoutrements have been given the boot to make way for gorgeous polished stainless steel and aluminum tootsies. And yet, it takes no more than a casual listen to realize that, for all its design and manufacturing mutations, the Prestige 95F is absolutely the product of its heritage. It is undeniably a Paradigm speaker...but we'll get to all of that in short order. Before we dig too deeply into the setup of the Prestige 95Fs, I should probably admit to something. My name is Dennis, and I have a serious binding-post fetish that is matched only by my borderline obsessive fascination with the tactile response of volume knobs. If you don't share that particular predilection, what I'm about to say probably won't resonate with you in the slightest. As I was connecting my pair of Kimber Kable 12TC speaker wires to the Paradigms (with Peachtree Audio's nova220SE integrated amplifier at the other end of the chain), the experience was akin to an autonomous sensory meridian response. Silly? Perhaps. But even if the silky smooth feel of the binding posts and the fingertip-tickling satin finish don't make you feel tingly, I still think you'd appreciate the fact that Paradigm poured just as much love and attention into these rarely seen connectors as they did the rest of the speakers' industrial design. Setting aside such (arguably trivial) aesthetic observations, the most substantial thing I have to say about setting up the Prestige 95Fs is that placement required a little more thought and attention than was the case with my Studio 100s. The former, after all, features a front-firing tuned port, whereas the Prestige 95F sports two rear-firing ports: one behind the tweeter, and the other behind and betwixt the pair of eight-inch brushed pure-aluminum woofers (the third eight-inch driver, although identical looking from the front, is actually a midrange driver). As such, the Prestige 95F interacts with the space behind it a little more and performs its best at certain distances from the back wall. In contrast, I've found that I can plop my Studio 100s pretty much any-old-where without too much deleterious effect. 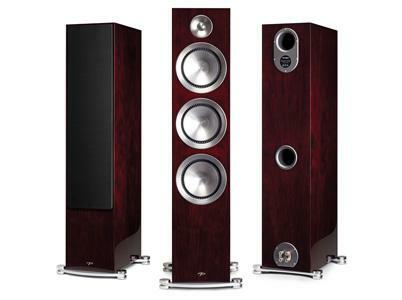 In my room, I found that the pair of 95Fs sounded its best anywhere between 10 inches and a couple of feet from the back wall (which gave me more than enough wiggle room) and slightly toed-in. Truth be told, though, I couldn't really find any placement options that resulted in unsatisfactory performance. In other words, the Prestige speakers reward a little extra effort in terms of positioning but don't punish you if placement is dictated a bit by room décor. The one other thing worth noting about the setup of the Paradigm Prestige 95Fs is that they do require the weensiest bit of breaking in. Generally speaking, I tend to be skeptical about speaker break-in. More often than not, I find myself adapting to the unique voicing of a new speaker after a few hours of listening, as evidenced by the fact that I can swap an older, well-used speaker in for whatever I'm currently listening to, and it still takes me a few hours to adjust to its sound. With the Prestige 95F, by contrast, there's simply no denying that the first few hours of use result in some substantial objective changes: the slightest amount of harshness in the treble (really only noticeable in very open and airy recordings) fades away, and a minuscule dividing line between the eight-inch midrange driver and the tweeter is slowly erased. Paradigm recommends "several" hours of playback before critical listening commences. I found that roughly three hours of continuous use did the trick.